Mr FitzPatrick is accused of failing to disclose multi-million euro loans to auditors. The prosecution alleges that the amount of the loans was “artificially reduced” for a period of two weeks around the bank’s financial end of year statement by short term loans from other sources, including Irish Nationwide Building Society. 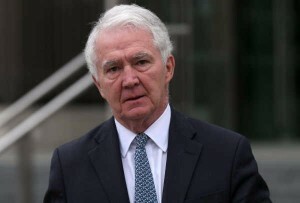 On day 70 of the trial at Dublin Circuit Criminal Court, Bernard Condon SC, defending, continued his cross-examination of Mr O’Connell, a legal advisor with the ODCE who dealt with witnesses from EY (the Ernst & Young), Anglo’s auditors from 2002 to 2008. He put it to Mr O’Connell that in April 2010 he had gone into his first meeting with key witnesses from EY with an acceptance that they had not known about the movement of loans to Irish Nationwide. Mr O’Connell replied: “I see it suggests a degree of prejudgement” but added that there was nothing in the evidence he had so far received that the loans had been disclosed to the auditors. Mr Condon said that if the loans had been made known to EY “we wouldn’t be here” in court. “That is an absolutely colossal piece of prejudice. That was wrong to do,” he said. Mr O’Connell said he agreed adding: “It was a very inexperienced way of approaching the matter”. Counsel described as “an outrage” the failure of investigators to ask witnesses about auditing standards which suggested auditors remind directors that it was a criminal offence to mislead auditors. “You were charged with carrying out a fair and impartial investigation,” counsel said, accusing Mr O’Connell of deliberately deciding not to ask about these standards. “If they were to say something about this, it would undermine your ability to bring a prosecution at all. I think that is so,” counsel said. Mr O’Connell told the jury that his team did not have the resources it needed to properly investigate the case. The court heard that in early 2009 civil servants from government departments were assigned to the ODCE and that around 16 of these, including legal staff and gardai, were involved in the Anglo investigation. Mr O’Connell said that with all due respect to these personnel, in hindsight he felt they did not have the necessary skills needed for a criminal investigation. “What were needed were skilled investigators. Their skills were not in area of criminal investigation. That was what was needed at the time, not more people who lacked that background. “At [the] time we did not appreciate the risks being created by people like me undertaking work that would have been better done at gardaí,” he said. He said that he had “oversubscribed” to the idea of “doing more with less” and had taken on more than he was qualified for. The jury heard that in March 2011 Mr O’Connell attended a meeting with the senior government officials, the then garda commissioner Martin Callinan, and his deputy, Derek Byrne. Counsel put it to Mr O’Connell that at the time the ODCE were offered by very senior officials “any resources, anything they wanted”. A note from the meeting states that “both gardai and the ODCE stressed they had adequate resources”. Mr O’Connell said the then Director of Corporate Enforcement, Paul Appleby, had a view regarding resources and that he it was not his position to go “out on a limb” and “independently or separately lay claim to resources”. The witness agreed that he was involved in taking witness statements despite being “untrained” in that area. The jury heard that during the trial in April 2015 the judge found this process to be “sub-optimal” and since that it has changed so that statements in ODCE investigations are now only taken by gardaí. Mr O’Connell denied that he encouraged the auditor witnesses, Vincent Bergin and Kieran Kelly, to involve their lawyers in the process of making their statements. He said that he didn’t think they would have agreed to make a statement without being “lawyered up” but accepted that he never asked them to do so. Mr Condon accused Mr O’Connell of witness coaching during a meeting with Mr Bergin and in house lawyers from EY. “We can never know what they would have said without your intervention,” counsel said. Mr O’Connell agreed but said he didn’t think this meant the witness evidence was completely damaged. He agreed that it was inappropriate of him to have said, during this meeting in April 2010 that “we hope there is an adequate basis to prosecute Sean FitzPatrick”. He denied that the mindset of the ODCE was to “try and do Mr FitzPatrick”. The jury heard that Mr Bergin’s final statement provided to the investigation team came about after a six month process involving 20 drafts going back and forth internally within EY and their lawyers.